One of the things you have to get used to living in India is the power cuts. Power cuts are as common as autos, dhal and dosas – just another part of life here. Chennai, where we live, is having power problems right now, and the entire city has mandated 2 hour power cuts daily. Due to some glitch in the system, our power goes off at the set time but then comes right back on. But I’m thankful for that as summer is here and the temperatures are 35C and climbing, and May will be hotter, over 40C daily. Why do they cut the power every day? It is called load shedding. The demand for power is higher than what they can produce, so during the hottest time of the year, when an air conditioner becomes a need, everyone has to endure power cuts. Some people have generators and inverters so they can at least run fans at that time. Not us. So on with my story. It begins last Sunday evening at 10:45 p.m. Logan and Lila had just gone to bed and were still awake; Scarlett was already asleep. I was getting ready to do the dishes when the power goes off everywhere. I took my phone into the kids’ bedroom and used it for light, thinking it would be back in a few minutes. After about 10 minutes, I figured candles would be a better option for light, plus the room was already warming up without the fan and AC on. 11:00 With a candle outside the door for the kids to have light, I leave them to take a shower. 11:10 Finish shower. Come out to find Glad and kids on the balcony. It’s much cooler out there. Kids play and we wait expectantly for the power to come back. 11:30 Scarlett wakes up ’cause she is too hot. Bring her outside, and Glad suggests we put a mattresses outside. Kids lie down and count stars with daddy, then sing “Twinkle, Twinkle, Little Star”. 12:00 Neighbors’ power is back, ours is flickering. There is more singing and star counting. 12:30 We are still awake. My attempts to get Scarlett to sleep again have been unsuccessful. Kids have no desire to sleep. Glad calls electric company numerous times to find out why our house has no power yet. No help from them. He and kids are now passing the time by burning all the leaves that are on the balcony, one at a time, with the candles. I am so tired but there is no hope of sleeping. While it is cooler outside, it is still hot and there are mosquitoes. 1:10 Tiredness is taking over, replacing the earlier excitement of being up late and playing outside way after bedtime. Kids are lying down on purpose. I still can’t sleep. 1:15 Resign ourselves to a long, hot night outside, while listening to the hum of the neighbors’ AC’s. Glad decides to walk down to the local power station’ which is literally down the street from us, to see if they can help. 1:25 Lila asleep; Logan fussing; Scarlett restless. 1:40 Scarlett still fussing every time someone touches her. Logan asleep. I’m so tired but Scarlett wakes me every time I doze. 1:50 Glad gets back. He found out a cable for our house is damaged and will take a day to repair. Of course work will only begin in the morning. We decide to pack up the kids and a mattress and go sleep at the school Glad works at. (It is a cute house converted into a preschool.) Call a taxi. I pack up sheets and blankets. 2:15 Taxi arrives. I move kids to couch and put their shoes on. Lila wakes up. Glad puts mattress and bag of stuff in taxi, then we take the kids down. Logan and Scarlett are now awake. With Glad leading the way on his scooter, we head off. The ride is a literal 5 minutes as the roads are deserted. 2:20 Arrive at the school. Set up mattress in one classroom. Convince the kids they have to go back to sleep and that they can play there tomorrow (summer camps were starting). 2:30 All in bed. 3 kids and I squish on single mattress. Glad sleeps on quilt on floor. 3:00 Kids finally asleep again. I wake through the night as I am not comfortable. 7:00 Glad wakes me as we have to leave before the staff show up. Drag myself up, try to look presentable. 7:15 Go with girls and mattress and bag in auto. Glad and Logan go on the scooter. 7:20 Scarlett fell asleep again during the ride home. I put her on the mattress that is still on the balcony. Lila lays on couch and refuses to come outside. I make Logan lie down with me and doze while he stays awake. Lila finally joins daddy in the bedroom and sleeps again. 8:15 Glad comes to balcony. Realize I won’t get any more sleep so I make us coffee and give Logan some granola. 8:30 Scarlett wakes up and shares Logan’s granola until I get her some. They sit on the balcony to eat it. Until repairs are done, we have no power so I want the kids to go for their summer camp activities even if they are a little tired. At least they will be cool in the air conditioned classrooms. 8:45 Wake Lila, feed her, dress kids, pack their backpacks with snacks, water and other needs for morning out. Glad heads out and says he’ll be back soon. 9:15 Kids are ready to go, but daddy is still out. He went to get his clothes ironed and I wonder what is taking so long. 9:45 Glad calls to tell me he is getting a hair cut and will be another 10 minutes. Kids are already 15 minutes late. I get Scarlett dressed and shower and dress myself. 10:15 Glad still not back, so I decide to take kids myself, since I also plan to stay out. Glad shows up just as we are out the door. Wants kids to wait while he showers but I said nothing doing and we left. (Activities had started at 9:30). 10:25 Arrive at school and drop kids. This is Lila’s first time being with a group of kids for activities and being away from me in a school-type setting. I hope she will be okay. 10:30 Scarlett and I head to the park next to the school for a few minutes but it is already so hot outside that I take her instead into the large gift shop next to it. We spend the next hour there browsing, getting gift ideas for Lila’s birthday. 11:30 Glad calls to tell me that Lila has had enough, and can I come get her? We walk back. 11:40 Get Lila. She decides she now wants the snack she hadn’t eaten earlier and she and Scarlett share it. 12:00 Head home. Find same auto we went in in the morning (pure chance). Scarlett falls asleep on the way. 12:10 Home. Power still off. Men are digging out front of the house. Looks like a big job. Put Scarlett in bed and make lunch as best I can. 12:35 Glad and Logan come home. Logan said he did a planting activity and he used “dirt, mud, and soil” to plant the seeds. Ha. So cute. We eat, then I convince kids to nap on balcony. 1:00 Logan asleep. Lila still perky since she slept longer in morning. I try to sleep but Lila keeps me awake. 1:30 Scarlett wakes up, nurses, but doesn’t go back to sleep as usual. I give her a snack to try and buy some sleep time. 1:45 Lila asleep. I slept for maybe 10 minutes. I’m so tired but no chance of sleep. Get coffee, sit outside with Scarlett and do puzzles in newspaper. 2:45 Glad calls from work to ask if power is back. Not yet. 3:00 Glad comes home because he is tired. Tries to nap on balcony as I wake kids and prepare to take them to the mall. My head is beginning to hurt from being too hot and tired. Pop a pain killer and get ready to go. Shower again. Glad can’t sleep and heads to the gym instead. 4:00 Leave for mall with kids. 6:00 Decide to go down from 3rd floor by elevator and Logan freaks out like I have never seen. He was screaming, trying to run and bite me all at the same time. Took a good 10 minutes to calm him down and he finally tells me he is scared of the elevator and won’t go on it. Amazingly, Lila was able to hold Scarlett’s hand the whole time and keep her from running off. Finally take the stairs all the way down. 6:30 Leave after picking up a snack and buying a few groceries. 6:45 Home, power is on. Yes! Scarlett falls asleep again. 7:15 Make a quick dinner of egg-in-a-hole while kids watch a video. Scarlett wakes up. 8:15 Showers, get ready for bed, read new books. 9:00 Kids in bed, sleep quickly. Scarlett stays up because of her earlier nap. 10:00 Glad home; Scarlett shares his dinner and some snacks. 11:30 Scarlett finally asleep. I shower for the third time and crash into bed. I sleep so soundly that when I wake in the morning and find Scarlett next to me, I can’t recall taking her out of her crib or nursing her, though I know I did both. I hope this doesn’t repeat any time soon!! 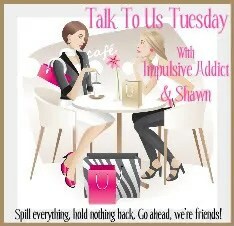 Linking up today for Confessions from an Impulsive Addict‘s meme Talk To Us Tuesday.